All but the most brave and knowledgeable of self builders will use the services of a builder. How do you know that your builder is the right person to build your home? Here are ten questions to ask your prospective builder when you first meet. Do you Have Business Premises? This may sound silly but a builder needs to have a professional base. For some it may be that they have a yard attached to their home but if they cannot tell you where they store materials it sounds as though they are a one man band who orders as he goes along. This could hold your build up if he does not have materials and tools in stock. What Qualifications do you have as a Builder? It stands to reason that someone who says that they can build a house has trained in the field of house building. It is not unusual for a builder to have served an apprenticeship as a carpenter or trained as a brick layer and gradually moved on to owning his own building company. Ask about his membership of master craftsmen associations. If the builder has a website follow up any memberships mentioned with the associations. How Long have you Been a Builder of Houses? By asking this question you will gain an idea to how long he has been trading as a house builder. If you receive strange replies and alarm bells start to rung then be prepared to halt the meeting and walk away. Granted, your builder will have to have started somewhere when entering the house building trade but you really don’t want it to be your house that is the first do you? Ask to see details of his insurance cover for public and employee liability. Can I see the Houses you Have Built? Do not take his word that he has built houses ask for proof. Many workmen show testimonials on their business websites but check they are genuine. Can I Speak to Some of Your Customers? Be prepared to knock on doors and speak to the owners of houses he has built in the past. This is where you will hear the truth. Remember though that no one is going to give you the name of an unhappy customer. If you need more information speak to the planning control department of your local authority to see if they have knowledge of the builder. Use internet search engines to see if his name or that of his company pops up in reference to bad practice. 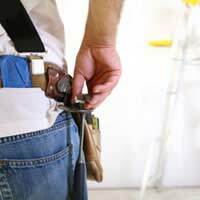 Any tradesman should have references from previous customers whether they are other building companies that have sub contracted his services or home owners who have been happy with work done in their homes. Do you have Reliable Staff? Ask about his staff, are they on the payroll or does he need to hire them in on a subcontracted basis? You do not want your build held up because of staffing issues. Are you Knowledgeable about Site Safety? Does the builder know about site safety? Will he implement and oversee the site when you are not around? Does he come across as being someone who can have command of staff and look after your building site? You need to give the builder a detailed list of all your requirements before he can give you a price for the job. Once a price is agreed set up a contract that shows a timeline of the work and retentions agreed upon for work running over schedule. Agree to when the stage payments are to be made. If your builder is good at his job he may be booked up for some time so make sure he knows your deadline for completion of work. After asking these questions you will have gauged whether the builder is someone you want to build your home. Rely on your gut feeling. If you are uncomfortable in any way at this point interview more builders before hiring the right person to build your home.